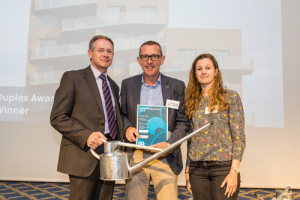 The 2018 winner of the Duplex Systems Award in the Galvanizing Awards competition was Newground Architects with Rehearsal Rooms. Rehearsal Rooms, a residential-led mixed-use development, is one of the first completed in London as a bespoke private rented sector (PRS) product. Rising above the tree-topped embankment of North Acton tube station, the building forms part of an emerging neighbourhood and provides 173 one-, two- and three-bedroom flats. 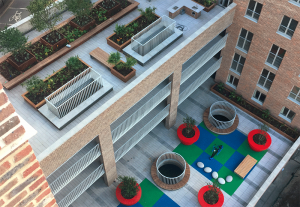 Designed around the needs of a fast-growing tenure, the scheme of the project that won the 2018 duplex systems award sets a benchmark by meeting social and services requirements at a local level. View more details about the project here or find out more about the GAGA construction awards.